This recipe is a superstar in our kitchen. Simple to make and tasty to eat. In a food processor, puree cannellini beans with lemon juice, garlic, and a little parsley. Stream in some olive oil. That’s it! This dip comes from one of Giada’s lovely cookbooks. I discovered the recipe a few years ago and immediately added it to the regular rotation of party food at our house. 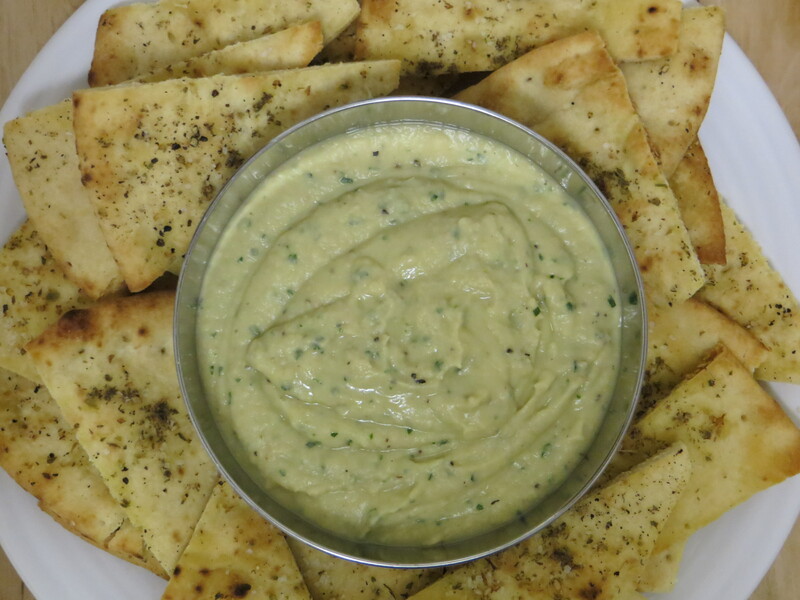 Everyone we’ve shared this dip with has loved it, especially when accompanied with homemade pita chips. Don’t skimp on making the chips – they are so good! If you have leftovers, this dip makes an excellent spread on veggie sandwiches. A nice change of pace from hummus. Also, play around with the spices on the pita chips. In addition to (or in place of) the oregano, I’ve used paprika, cumin, and/or za’atar. It’s all good! In a food processor, combine beans, parsley, lemon juice, garlic, and ½ teaspoon salt and ¼ teaspoon pepper. Pulse on and off until the mixture is coarsely chopped. With the machine running, gradually mix in 1/3 cup olive oil until the mixture is creamy. Taste a little to see if you need to add more lemon juice, salt, etc. Cut pita bread into triangles and arrange on a baking sheet. Brush the triangles with olive oil and sprinkle with salt, pepper and oregano. I like to pour some oregano into the palm of my hand and then crush it a little before sprinkling. This step helps release some of the flavor and aroma of the dried spice! Bake the pita triangles at 400 degrees for about 5-10 minutes. Check them after 5 minutes so you can monitor how crispy they get. I like mine on the softer side. Categories: appetizers, beans, cannellini, dip, easy, pita bread, snacks, vegan, vegetarian | Tags: appetizers for The Oscars, cannellini beans, dips, healthy snacks, pita bread, vegan, vegetarian | Permalink. This is a really tasty recipe that I don’t cook nearly enough. 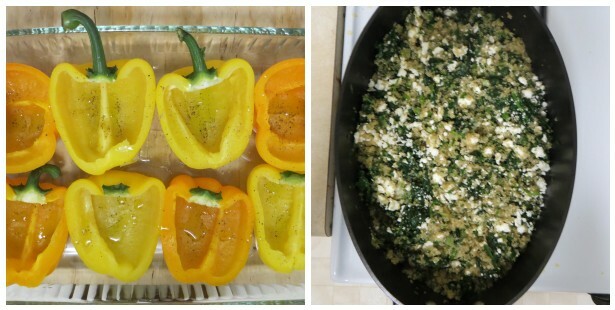 Bell pepper halves are filled with a flavorful quinoa and spinach stuffing, with some feta crumbles thrown in for good measure. It is filling and wholesome. Served with a fresh green salad on the side, it makes the perfect dinner and leftover lunch the next day. Here’s how I make this dish. First, I prepare the pepper “cups,” making sure to season them with a little olive oil and s+p. I want the peppers to have as much flavor as the stuffing. Then, I cook the quinoa and prepare the stuffing mixture. It all comes together pretty quickly. I often prepare the pepper “cups” first so that they are waiting for me when the stuffing is ready. For the spinach, I usually use two entire bags of baby spinach leaves. It seems like a lot when you add it to the pan, but it really cooks down. Also, don’t forget to add the extra drizzle of olive oil before baking – it helps to brown and crisp up the tops! 1. Bring 2 cups of water to a boil. Add ½ teaspoon salt, then the quinoa. Give it a stir, then cover and simmer over low heat about 15 minutes. The quinoa is cooked when most of the water has been absorbed and the grains reveal their spirals. 2. Prepare the pepper “cups” for stuffing. Slice the peppers in half lengthwise and cut out the membrane and seeds. Simmer them in some salted water for about 3-4 minutes. You just want to get them a little soft; don’t overcook them. Remove with tongs and set them in a baking dish. Drizzle a little olive oil over the peppers and season with salt and pepper. 3. Warm the olive oil in a large skillet. Add the scallions and jalapenos and cook for about 2 minutes. Then add garlic, cumin and spinach, along with 1-2 tablespoons water, if needed. When the spinach is wilted, add the cilantro, cooked quinoa and feta. Toss everything together and season with salt and pepper. Then, stuff the peppers with this quinoa mixture. 4. Preheat the oven to 400 degrees. Drizzle a tablespoon of olive oil over the peppers and pour a few tablespoons of veggie broth (or water) in the pan. Bake the dish (uncovered) for about 30 minutes until nice and brown on the tops. Enjoy! 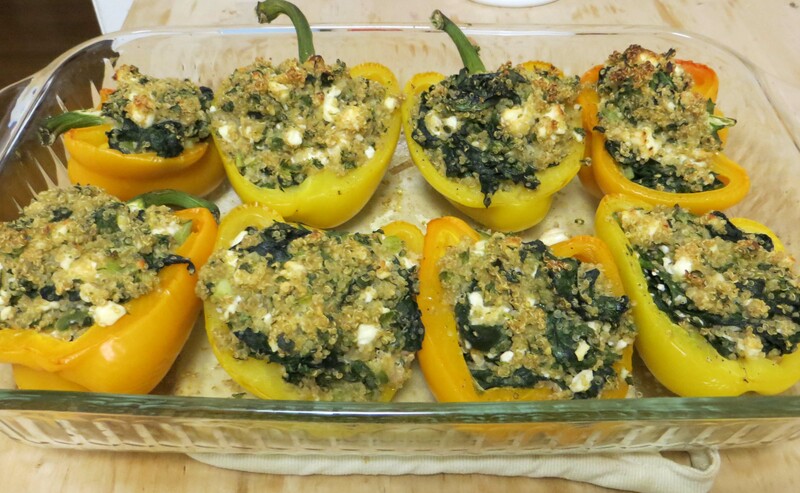 Categories: bell peppers, feta, quinoa, spinach, vegetarian | Tags: easy dinner ideas, feta, quinoa, spinach, stuffed peppers, vegetarian | Permalink. I think I’ve fallen into a recipe rut lately – same old soups, same old salads, same old snacks. Do you know the feeling? Nothing really wrong with what we’ve been making, but it was time to switch things up. I woke up Sunday morning thinking about carrot soup. Something creamy sounded good, perhaps with curry. But very little effort would have to be involved because, well, it was Sunday and I was tired from the week. After a little digging around the internet, I remembered a tomato-based carrot soup I saw some time ago here. I decided to give this recipe a go and save the curry-flavored carrot soup idea for another day (any recipe recommendations on that front??). This was actually my first time making homemade tomato soup. February is probably not the best time of year to do this since store-bought tomatoes in the winter can be kind of blah. We found some decent ones, though, and the soup had a very nice flavor. 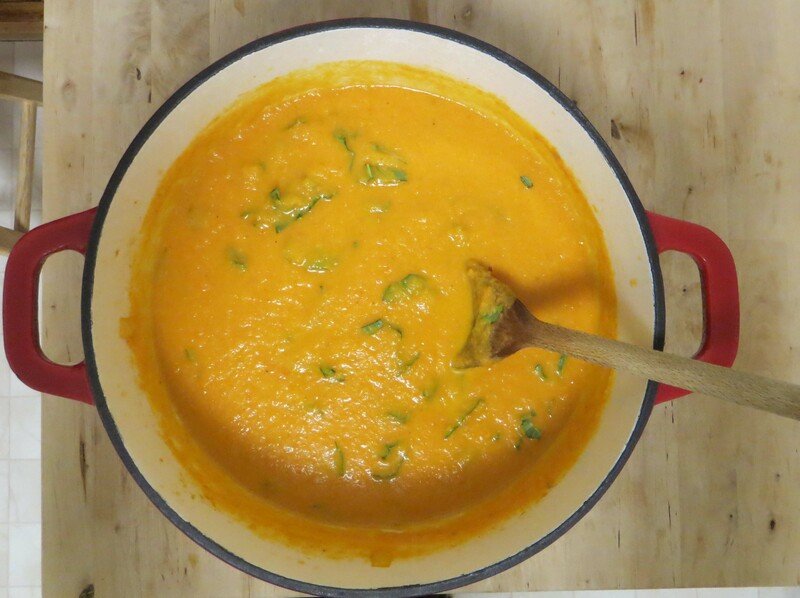 Still, it would be a lovely late summer soup, so I’ll try to remember that in about six months. The amounts all seem very flexible here, depending on the size of your vegetables and other variables. My recommendation is to just taste/eyeball things as you go, adjusting seasonings and amounts as you like. 1. Peel your tomatoes. I did this by dropping them in a pot of boiling water for about a minute. Remove the tomatoes and let them cool a bit. At this point, the skins just slide right off. 2. Cut the peeled tomatoes in half and remove the stems. Place on baking sheet, toss with about 2 tablespoons of olive oil, and season with a good amount of salt and pepper. Don’t be shy with the seasonings – you want the tomatoes to have a lot of flavor. Roast in a 400 degree oven for about 30 minutes. 3. While the tomatoes are roasting, chop up the rest of your veggies. Melt the butter and about 2 tablespoons of olive oil in the bottom of a soup pot. Add the veggies and sauté for about 15 minutes. 4. When the tomatoes are finished roasting, add them to the veggies along with the veggie stock. Continue to cook everything for another 15 minutes or so (until the carrots are soft). 5. Blend the soup. I did this with an immersion blender. 6. Stir in the milk and chopped basil. Enjoy! Categories: carrots, easy, soups, tomato, vegan, vegetarian | Tags: carrot soup, creamy tomato soup, easy soups, vegan soup, vegetarian soup | Permalink.